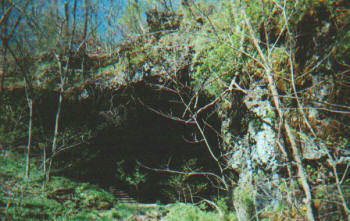 Smittle Cave is located about five miles northwest of Grovespring. It is on the land settled by Jacob Smittle Jr. when he came to Missouri about 1841-43. 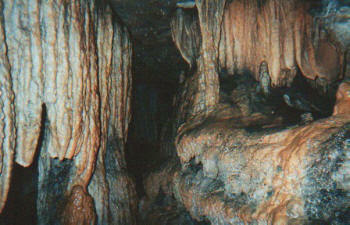 It is one of the largest caves known in Missouri. It has fifteen passageways with a total length of more than two miles. It has a double entrance, the North one being thirty feet high and fifty feet wide, and the South one about the same size but filled with rock and debris. Five passageways were commercialized - the Main, Meander, Water, Ball Diamond and Formation. 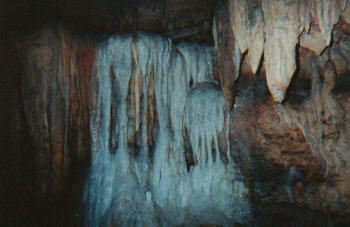 The cave has many large stalactites, stalagmites, strawtites, draperies and flowstone formations. Jacob gave little thought to the cave until one day a lone Indian appeared at his cabin and asked to spend the night. Jacob didn't trust him and was about to refuse when the Indian said he would bed down in the cave across the hollow. Jacob was relieved and agreed. In the years that followed the Indian returned many times and it was his habit to sleep in the cave. He told Jacob that someday the cave would be valuable to his family. I don't know if this was the Indian who sparked the story of the Lost Indian Treasure or not. There was supposed to have been a medicine man who used the cave for his home. He was very powerful and highly paid for his work and was to have stored his treasures in the cave. One day the Medicine Man disappeared and to this day the treasure has not been found. When Jacob died his son David obtained the land. He had a dream of opening the public the cave he had explored as a boy. David divided his farm between his two sons, Alfonzo and John, Alfonzo getting the half with the cave. David died in 1917 and never saw his dream come true. 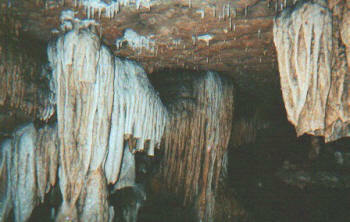 Alfonzo followed his father's dream and in 1925, using boats and lanterns, Smittle Cave was opened. Through the years that followed the cave became popular with tourists as well as local people who held many picnics, dances and foxhunts there. In time the boats were replaced with rock and wooden walks and the lanterns replaced with a Delco System used until the REA came to the area. The cave was open until the late 1950s when it was decided not to make the many needed repairs on the walks and it was closed, although occasional tours were given into the early 1960s.